I am thrilled to share some exciting news with y'all....... (drum roll please)...... 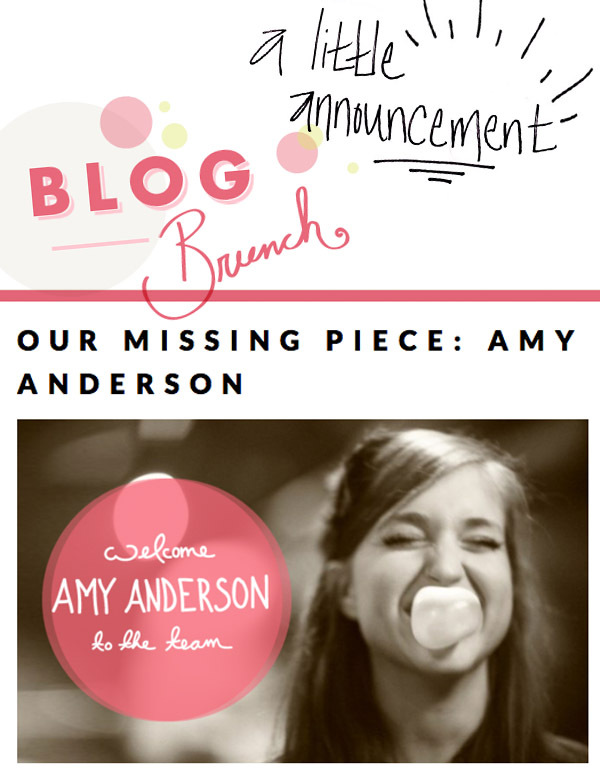 I've officially join the Blog Brunch staff! Katie, Megan and I make quite the dream team. I mean, seriously, where have these gals been all my life? These ladies are so amazingly talented and supportive. I'm honored to be a part of anything they do. If you aren't familiar with Blog Brunch, we are a collaborative network powered by bloggers wanting to share, dream and learn with other creatives in the blogging community. At the heart of it, our mission is to build an open space for creatives to nurture relationships, get questions answered and work together towards overall growth. Honestly, I've met some of the most inspiring bloggers, designers, writers and creatives through Blog Brunch and my biggest joy is getting the opportunity to celebrate along side them in their accomplishments. Our next brunch is April 7th at 1pm EST via Twitter. If you don't have a clue what 'via Twitter' means, that's totally fine..... check out this post on all the details. Plus, stay tuned as we begin planning live brunches in a city near you. And always feel free to shoot me an email with any questions!